Medical robotics technology is changing the paradigm of surgery, prosthetics, rehabilitation, and many other medical disciplines. Entrepreneurs and investors are eyeing on the game-changing potential in both physicians’ practice and patients’ homes. One example is the development of bionic limbs and exoskeletons. Such technology can be applied in various fields including amputees, persons with disability, and emergency response. The US Defense Advanced Research Projects Agency (DARPA) has recently launched new initiative to develop prosthetic limbs that feel and function like natural limbs for amputees. One of its grant awardees is a Utah-based company with an implantable wireless device that aims to increase reliability of prosthetic limbs and create a more natural movement. Another highly anticipated area is bionic eyes and artificial organs. The world’s first bionic eye received FDA approval in 2013. Thanks to advanced microelectronics and material science, the next generation of the bionic eye, artificial urinary sphincter, and other life-supporting implantable devices are underway and are expected hit the market in the foreseeable future. The investment community has also shown strong appetite for medical robotic innovations. A search on the LSN Investor Platform for investors interested in ‘Active Implantable Devices,’ ‘Electro Mechanical Medical Devices,’ and ‘Technical Aids for Disabled Persons’ yielded 625 results. 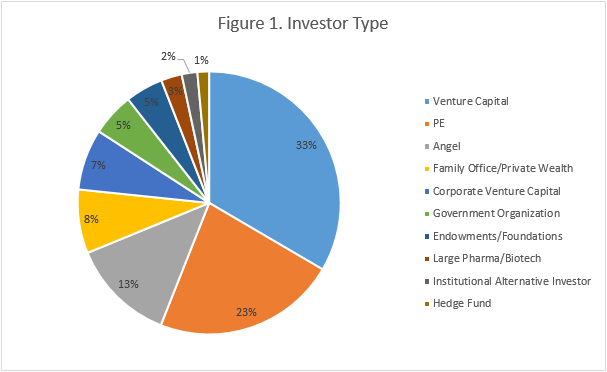 We see interest from throughout the investor spectrum; the majority are VC/PE firms, and we also see interest from angel groups, family offices, and corporate VC funds (Figure 1). 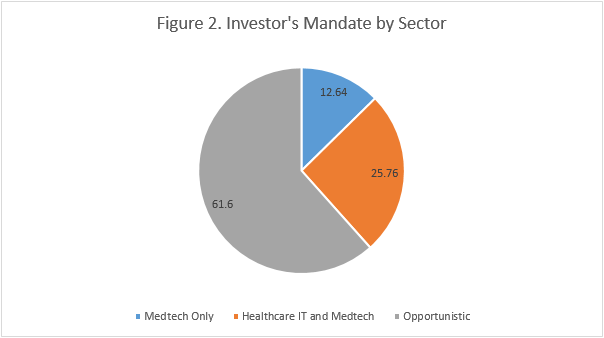 Many of the 625 investors are opportunistic, meaning that they are spread across sectors from MedTech to diagnostic to biotech to healthcare IT. However, 79 investors we have spoken to specifically indicated their mandate to find only novel devices that address unmet needs, including VCs and large medical device companies (Figure 2). A growing trend is that traditional IT investors are seeing medical robotics as an entry point to the healthcare field. For example, we recently spoke to a California-based evergreen fund backed by founders of a major telecommunications company. The fund manager told us that he is seeking data capturing, data analytics and instruments/robotics application in healthcare. 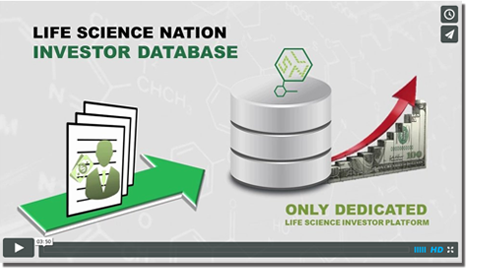 With no expertise in drug development, his team avoids therapeutic projects. However, they are happy to take on $250K – $1M investment in early-stage companies in the medical robotics field. Medical robotics have truly attracted global interests (Figure 3). 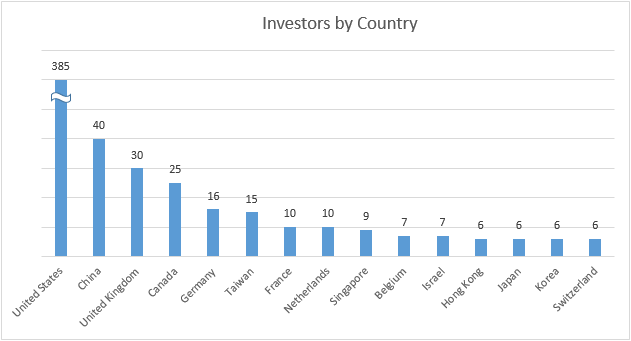 The USA clearly leads the field with 385 investors. Canada, the UK, Germany, France, and Netherlands are also very active. Asia-Pacific countries, including China, Taiwan, Singapore, Hong Kong, Japan, and Korea, are seeking medical robotics to help with their rapidly aging populations and rising rate of chronic diseases. For example, in January this year a Beijing-based investor led a $17M round for a Massachusetts-based bionic prosthetic startup company. The company is developing lower-limb prosthesis that mimics normal ankle movement and offers powered propulsion for persons with disability. The capital is intended to form new strategic partnerships and expand into the China market. Strategically, many China-based investors are eager to turn their traditional manufacturing powerhouse into high value-added healthcare innovations. A manager of new VC fund from Beijing said that his team is most interested in minimally invasive surgical instruments, artificial intelligence and robots, diagnostic tools, and mobile health innovations. His fund is backed by one of China’s largest TMT companies, and his mandate is to find solutions that can capture large healthcare market share and are compatible with the founder’s IT background. Medical robotics entrepreneurs are entering an exciting time when a growing number of investors from various backgrounds are jumping in to the intersection of computer science, material science, and medicine. It is imperative for entrepreneurs to think strategically when building alliances globally that will propel their products to the next stage.